Generally, your resume can be arranged in one of three basic formats: Chronological, Functional, and Combination. The Chronological resume presents your work experience in reverse chronological order (your last job should always appear first). In the “last job appears first” order, the corresponding titles, employer names, places and dates of employment are included along with information on relevant experience and achievement. The Functional resume presents your total work experience without the use of dates or places of employment. The reader’s attention is usually focused on three or four major areas (categories) of your expertise, accumulated skills (skill sets), results and accomplishments that are the most marketable or in demand. The Combination resume “combines” elements of the chronological and functional resume formats. For example, the employment history is presented in the “last job appears first” order, yet only the title, employer name, place, and dates of employment are presented. The normal corresponding job experience and achievement information is aggregated into two to three categories emphasizing the person’s skills and abilities most relevant to the job desired. Although the information you furnish the reader may essentially be the same, there’s a big difference in the way the three resumes are constructed, and the type of impact each will have. The functional resume format works well if you’ve changed jobs or careers often, and wish to downplay your work history and highlight your level of expertise. However, if a prospective hiring manager is specifically interested in a steady, progressively advancing employment history (as most are), then the functional resume will very likely raise too many red flags, and therefore work against you. The functional format can seem confusing and might arouse suspicions as to your potential for longevity. Accordingly, you may choose to use this format on your own, yet we do not accept it at Belcher & Associates. We require resumes to be in the Chronological, Enhanced Chronological, or Combination format. The combination resume is a good resume format for most people to consider. However, in order to work well, your resume must be very well written and attractively laid out. My experience has shown that the chronological resume most often brings better results than the combination format since the chronological presents the most explicit description of the quality and application of your skills within a specific time frame. It works well for a person who has at least two years of progressive experience in a chosen career field – accounting and/or finance for example. Of the three formats, the chronological resume is also the easiest to prepare and review since it is presented in a logical “last job appears first” order, and includes title, employer, name, and place, dates of employment, plus relevant experience and achievement. For most professionals in accounting / finance, regardless of experience level, we recommend what we refer to as the enhanced chronological resume format. Essentially, this is just what it sounds like – all of the benefits of the chronological resume, including description of experience and achievements relevant to each job presented. 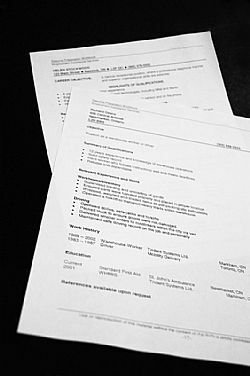 However, the top of the resume is enhanced by having an exceptionally strong summary (usually in bullet form) that succinctly emphasizes special skills, exceptional achievements, and work experience that are highly relevant to an employer likely to offer the type of job desired by the candidate. We also prefer this because hiring managers and Human Resources interviewers prefer crisp-looking resumes that are clear and get to the point. Exemplary examples of this preferred resume format are available one page back at Resume Templates.